Many of us picture owls in the sky, silently soaring, or perched atop tree branches or light poles as they sleep or keep an eye out for prey. However, on my first trip to Aruba I scanned the ground for a very special type of small owl, known for its terrestrial antics. The Aruban Burrowing Owl hunts primarily from the ground, hopping and running after lizards, insects, and small mammals. Unfortunately, due to development and other pressure on their populations, their numbers in Aruba have been falling. As a result, the Aruba Birdlife Conservation Foundation began a campaign to make the Burrowing Owl the country’s national bird, which was officially named in 2012. The added publicity – the bird now appears on Aruba currency and stamps – will draw attention to needed conservation and protection efforts. 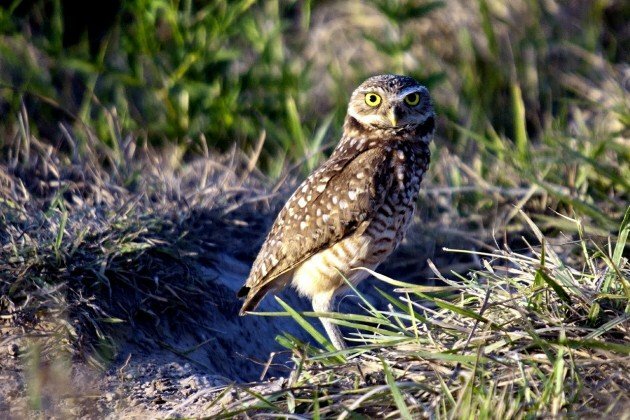 Burrowing Owls also gained greater recognition after a 2006 film, “Hoot,” was released. Though not based on the Aruba populations, the movie portrayed a group of friends from Florida trying to save Burrowing Owl habitat from destruction. Burrowing Owls, whose range extends into Mexico, the United States, and South America, can live in varied habitats, including deserts and grasslands, golf courses and airports, agricultural fields and vacant lots. These owls use the tunnels of other species as their nesting burrows, and so can be found associated with ground squirrels, tortoises, and prairie dogs. They are fairly small owls, standing around eight inches tall and weighing a little more than five ounces. Their plumage is mottled brown and white, and they sport long legs, short tails, and bright yellow eyes. White “eyebrows” give their face a distinctive look, and because they lack ear tufts their heads have an overall rounded appearance. Unlike many other owl species, the male and the female are the same size. They hunt both during the day and into the night, making spotting one more likely.